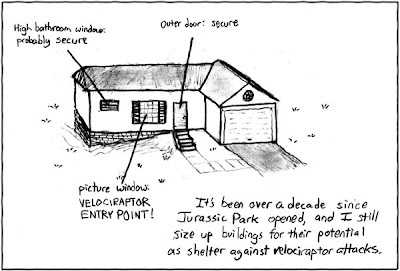 A Wink & A Gun: Is Your House Safe From Velociraptors? LMAO...I never considered velociraptor attack a serious threat but i actually have a book that is a zombie survival guide that is so heart-attack-serious it is hilarious. I got it as a gag gift from my wife since we are obsessed with zombie movies. I learned that I may need to secure some kind of shotgun and lots of ammo (they gave a specific # of rounds) if I truly want to be safe. Love sh*t like this haha.